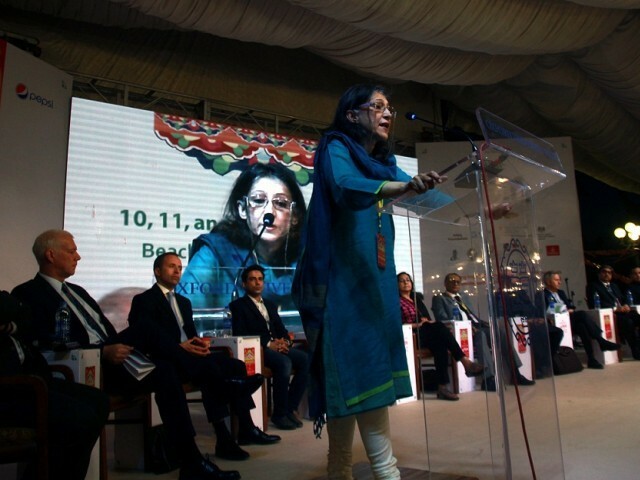 KARACHI: The eighth Karachi Literature Festival (KLF) kicked off on Thursday with a fiery speech in English of author Ayesha Jalal, followed by writer Mustansir Hussain s Tarar’ dialogue in crisp Urdu. During his speech, Tarar talked about how an adviser to the prime minister had noted that after Zarb-e-Azb, the need of the hour was a ‘Zarb-e-Qalam’, implying a war with the pen. “[He forgot] for a while that the pen is really the voice of the voiceless,” said Tarar. He was of the view that instead of looking towards the rivers of Ganga and Jamna, we should look towards the rivers of Punjab and Sindh for our cultural heritage to leave imprints on the sands of time. As the KLF is also celebrating the completion of 70 years to Pakistan’s independence, Jalal called out for ‘mature introspection’. Reflecting on the need of independence, Jalal said it was due because the people of the Indo-Pak region had fallen ‘slaves to barbarity’. However, she noted that we are in a ‘chronic state of national depression that stems from that time’. She talked about how Lord Mountbatten said about Pakistan that ‘they were hoping to put up a tent and no more’. At the time of the creation of Pakistan, they hardly realised ‘it wouldn’t collapse but turn into a concrete building leading to be a military barrack’. Talking about the China-Pakistan Economic Corridor (CPEC), she said that it will ‘in large part determine the country’s future’. From shaming late General Ziaul Haq’s seed of extremism sown in our midst, Jalal called for ‘a Pakistan that needs a better education system [and] notably better social scientists to channelise a constructive debate’. She was of the view that it was KLF and Coke Studio, which had really ‘pioneered the artistic scene in the country’. She called for Jinnah’s ideals to be upheld, in particular, the rule of law. “[It is something we have been] striving for the past seven decades,” she said. From co-founders of the festival, Ameena Saiyid pledged to give a diverse culture year after year to the people of Karachi while Asif Farrukhi promised to bring ‘A basant of books in our midst’.